Bring the joy of Christmas past to your home today with one of these amazing Gingerbread House Ideas. These designs will give you some inspiration for your tasty Christmas project. When my daughter was a little girl, we used to decorate a gingerbread house each year. She is now grown and lives away but comes home for the holidays and one of the first things we do is decide on the design for this year. We have made many different designs of gingerbread houses, trains, and castles as well as mini gingerbread villages. Each has been fun to do and makes a great addition to our holiday decor. And the taste! What is better than a whole house made out of gingerbread and then decorated with our favorite candy treats. It’s a challenge to get to the end of the project without eating the decorations! What is a gingerbread house? 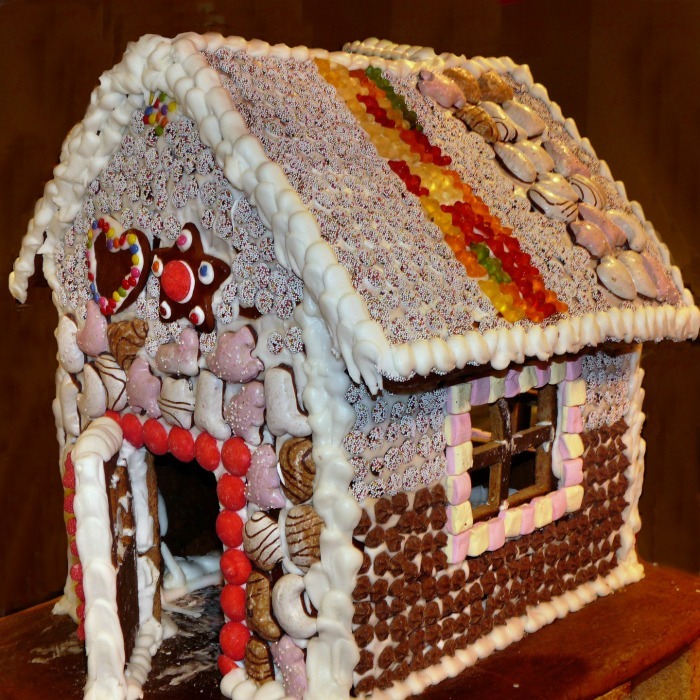 A gingerbread house is a baked confectionery that is shaped like a building and made of ginger infused cookie dough. The dough is cut into shapes that will make a house and baked till firm. The normal material for the house shapes is gingerbread but modern day moms often use graham crackers when making them with children, too. 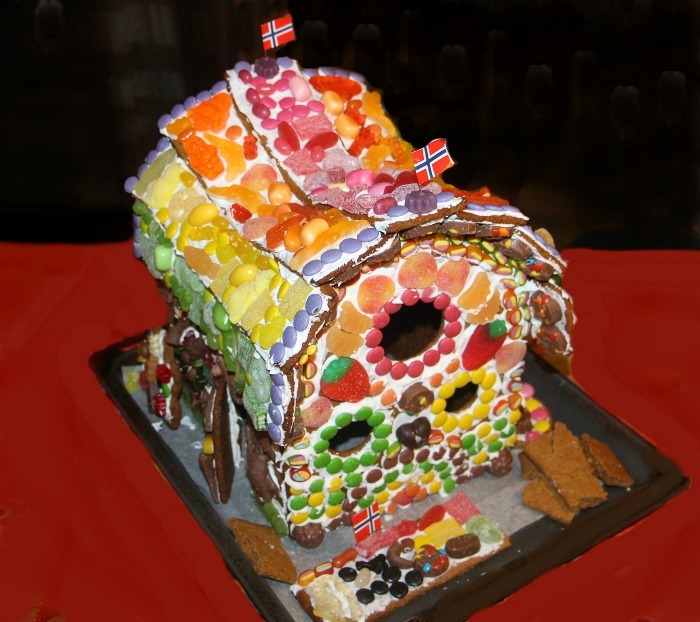 The houses are held together with thick icing and covered with a variety of candies. They are very popular as Christmas decorations. Many families, like mine, have making a gingerbread house as a part of their Christmas tradition. 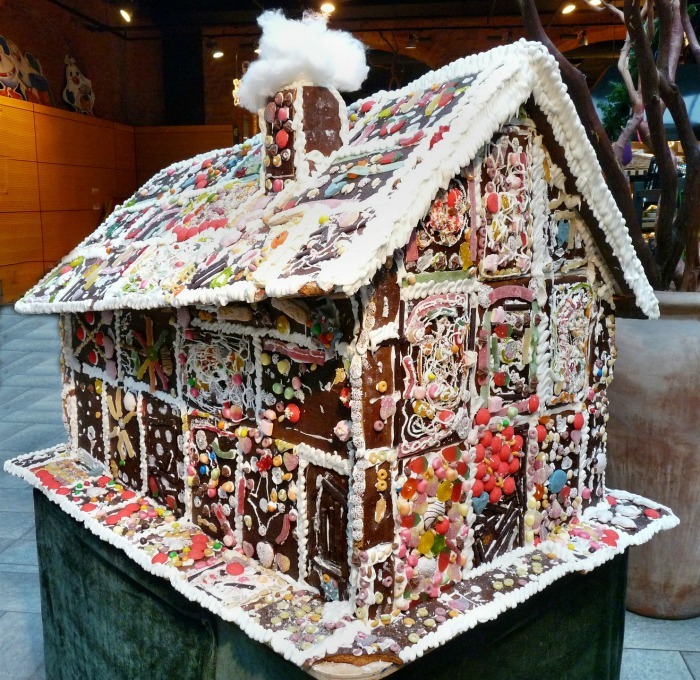 Is a gingerbread house meant to be eaten? 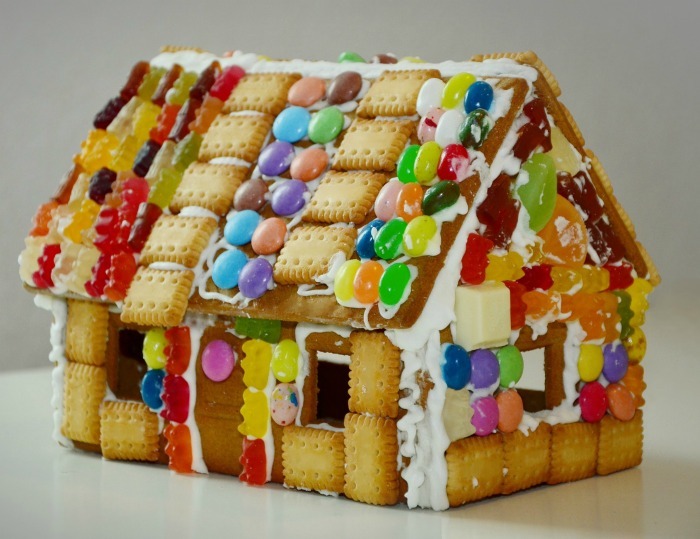 Unless you use glue to hold the pieces of the gingerbread house together, the entire house is normally completely edible, from the house sides, to the icing to the decorations. Gingerbread is very tasty and, of course, who doesn’t like candy? But having a house sitting out for many weeks, the materials used to make it will become less tasty as the month of December goes on. Pieces of gingerbread could also go moldy if left for a long time. The longer a gingerbread house sits out with the air on it, the more dry (and less tasty) it becomes. Icing and candy will also get very brittle over time which can be hard on the teeth. For this reason, it is suggest that if you do plan to eat the gingerbread house, it should be made close to Christmas day and eaten soon for best taste. Bring home the joy of Christmas past with candy cane fences, gumdrop pathways and candy laden roof tops. 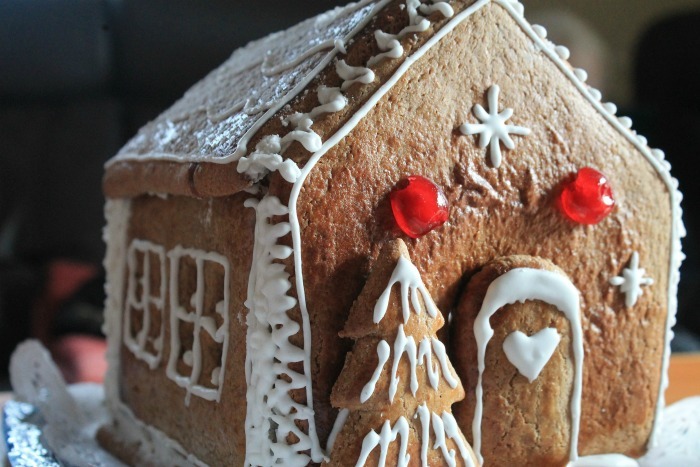 These gingerbread house ideas are sure to inspire you this holiday season. 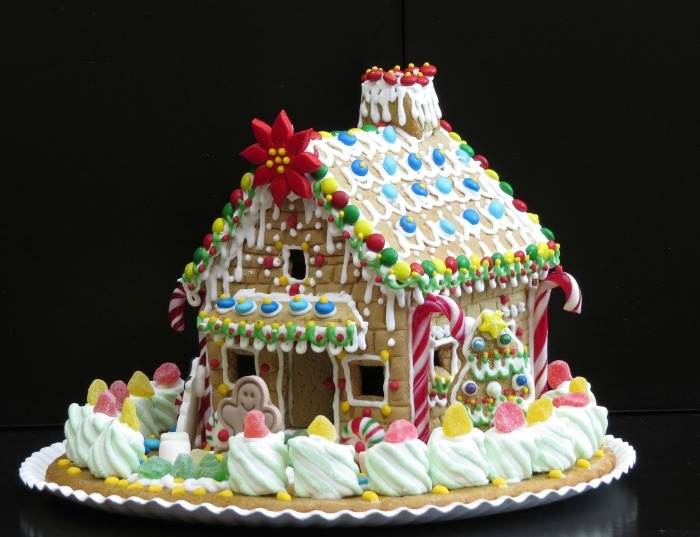 Are gingerbread houses a part of your Christmas tradition? 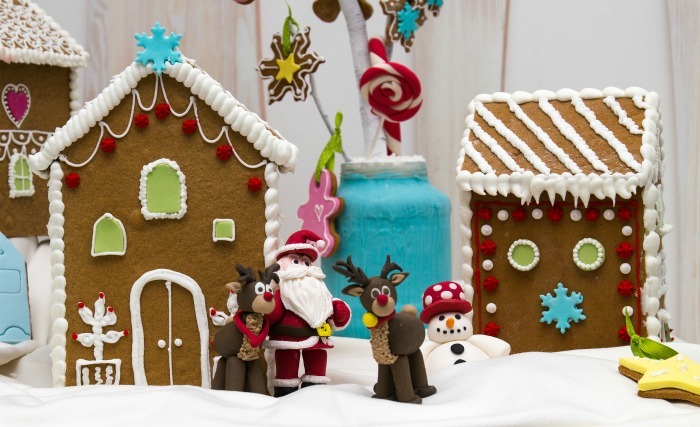 Check out these easy gingerbread house decorating ideas for some inspiration. Whether you want a mini house for a side table, or a huge design that takes up most of the dining room table, you are sure to find the perfect edible gingerbread house in this collection of gingerbread decorating ideas. 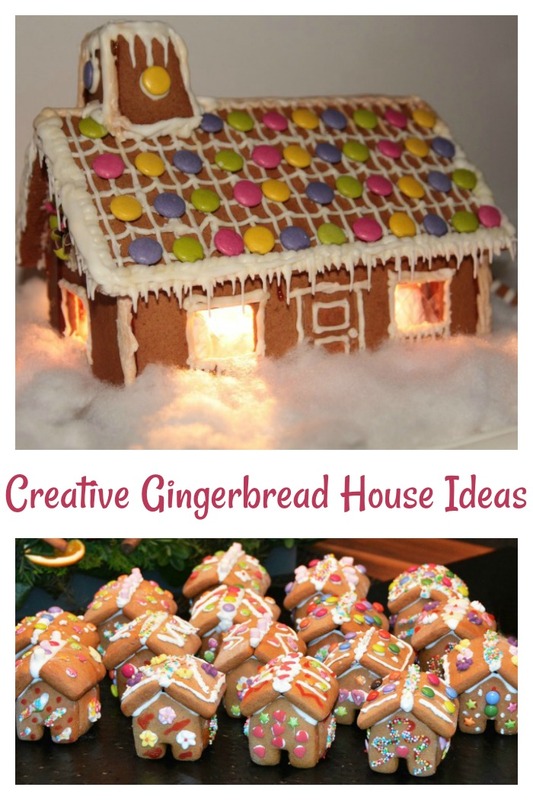 Be sure to also check out my round up of more gingerbread house designs here, as well as this post for my tips for the perfect gingerbread house. If you like the look of a simple and rustic look, this basic gingerbread cabin will allow the taste of the gingerbread to shine without the addition of a lot of extra calories from sugar and candy. The gingerbread is rolled out and cut into two peaked pieces, two sides and two roof sections and then baked. White icing holds the house together and adds some snow on the roof and on the tree at the doorway. Two maraschino cherries are the only extra dercorating item that is needed. Need a recipe for gingerbread frosting? Try my royal icing recipe. It holds the pieces together beautifully and only uses three ingredients. 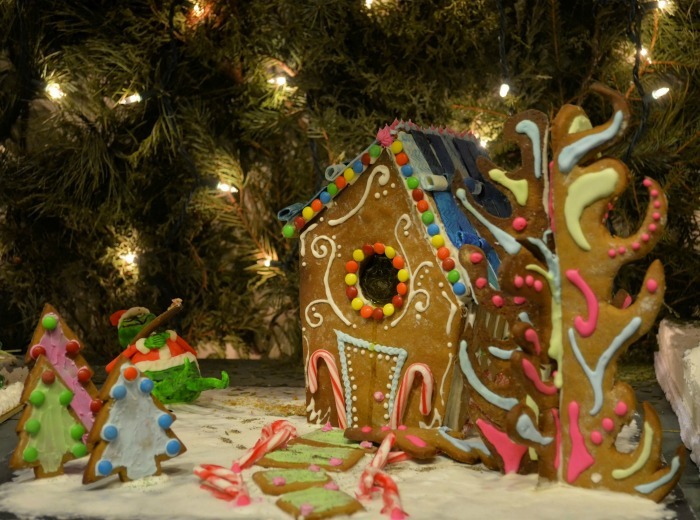 Candy takes center stage in this long gingerbread house with a chimney and decorated roof. Instead of a big variety of candy, this design uses colorful candy wafers (M & Ms would also work fine.) 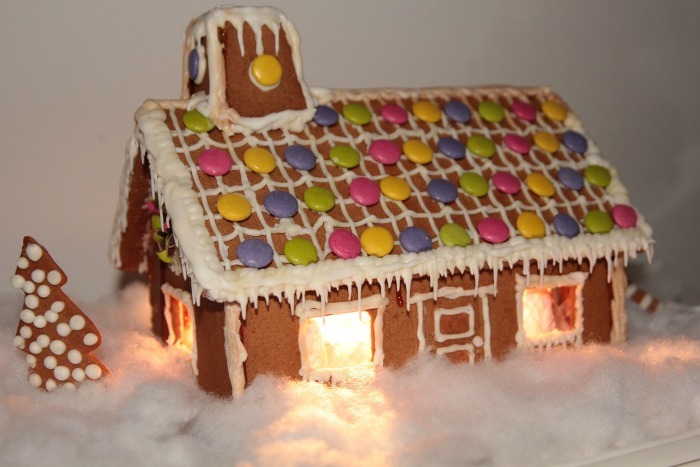 Just use a small piping tip to cover the roof to give the look of tiles and then add candy decorations in each section. Four smaller pieces of gingerbread are held together with icing and attached to the roof top to resemble a chimney. For extra effect, have some cut out windows on the sides of the house and place an LED light inside to give the look of a real house. This cute little gingerbread house design will be done in no time at all and is a good one to make if you would like the help of little children. Add a few candies and some edible figures on the inside of the house. Pull dabs of icing to a point for icicles and you are done. Bet this one won’t last long before being eaten! This design is one that the grown up tastes will like. Instead of a lot of candy on the house, the decorations are made of cookies and pretzels. To decorate this design, assemble your house shape then use the royal icing to attach cookies, chocolate leaves and pretzels to form “eaves” on the roof. A bit of piped chocolate on the European-styled Windows give an Alpine look as well as adding life to the cookie snowman. This cute gingerbread cottage is simple to decorate, since you’ll be adding small cookies as well as fairly large gingerbread house decorating candy and covering almost the whole house. This type of decorating gives the design a fairy tale look that the kiddies will love. The fun design of this cute gingerbread house uses candy rounds in a creative way to resemble the look of a stone cottage. 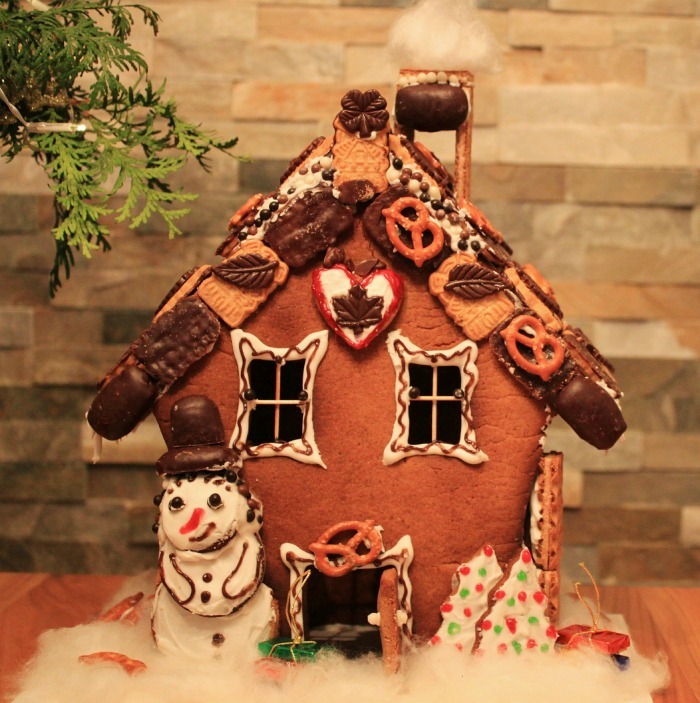 Instead of a peaked roof design, gingerbread pieces are layered over each other in an indented way. The entire outside is covered in various pieces of candy to give a pebble-like look to the design that is very fanciful. The round window cut outs add to the whimsical look. Do you have a classroom full of kids (or a houseful of your own with their friends)? Time to have a gingerbread house competition. Start with a (very) large gingerbread house design that has a roof attached. Use piping tips to cover the entire house with blocks outlined with the icing. Now the competition gets going. Have some gingerbread house decorations nearby and assign each child a square and let them decorate as they wish. The finished gingerbread house will have a collage look that is very funky and fun. Don’t forget some white cotton candy for the chimney! One gingerbread house is fun, but why stop there? This cute village design uses three simple and easy gingerbread houses to form a small village. The houses are simply decorated with just a bit of piped icing and some doors and windows as well are a few icicles and garlands. The rest of the color comes from small Christmas themed figures that bring life to the village. Really small children who aren’t able to help much with the decorating can be in charge of putting the figures in place. Turn a plain gingerbread house into a log cabin with strategic placing of the decorations. Start with your basic gingerbread shape and add icing sugar over the sides (do this in sections so it will remain sticky.) Cover the bottom half of the sides with Brach chocolate stars to resemble logs. The top half of the sides and front as well as most of the roof is covered with chocolate non pariels candy pieces for a snow covered look. The cut out gingerbread windows have a very rustic look and finally add more candy for the front and roof sections for some extra pizazz. If you like making gingerbread villages for Christmas decorations, this lovely design would make a fun country store look to add to your scene. The awning over the door and is just beckoning the quests to enter to see what treats are in store. Candy canes decorate each side of the house and the icicles are just dripping with sugar. Use a poinsettia flower mold to make cookies and add one of them at the top for a wreath like effect. Meringue powder mixed and placed into piping bags makes cute little snowbanks that are topped with gumdrops. The whole effect is just magical. My aunt made a Christmas gingerbread village similar to this when I was a child and I have always remembered it, to this day. Walking into her home and seeing all the miniature gingerbread houses under her Christmas tree made for a very special holiday. The little houses are made of thick gingerbread pieces. (don’t you love the way the little doors are all cut out?) 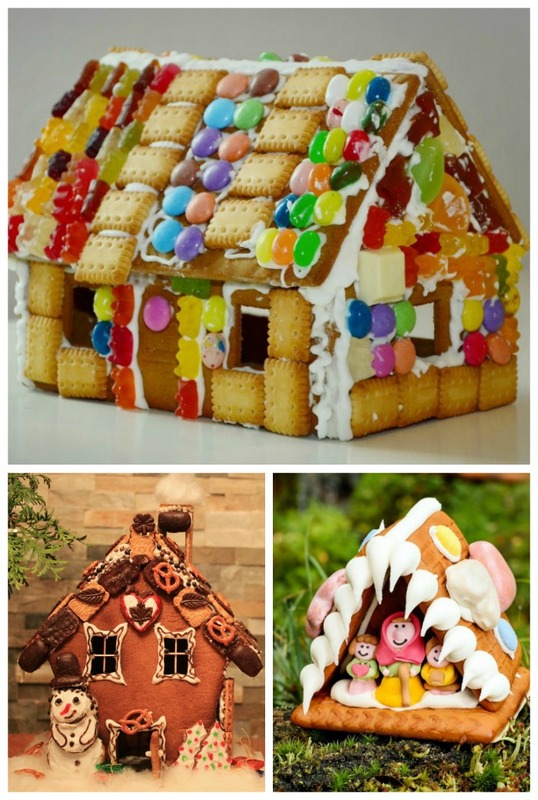 Each house is decorated simply with icing and a variety of candies for a fun look. Add in some Christmas figurines, or place them around a wooden train track for a unique look. The sides and front of the simple design have cut out round windows which allow the inner light from an LED bulb to shine out. Edible gold pearl decorations are place on the boughs of the tree and roof top line to coordinate the two. Trim the roof by piping a wide edging and diagonal strips and add some pastel colors wafer candies to add some subtle color. 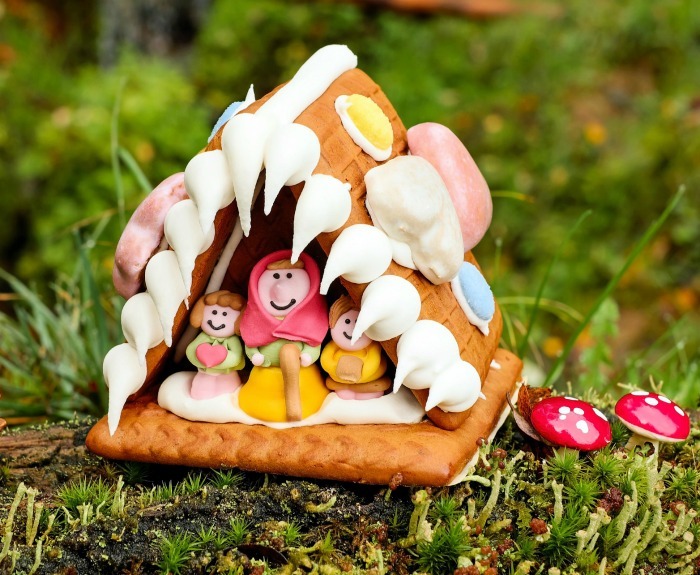 This cute gingerbread house looks as though it was meant for Whoville! The trick for getting the look of this cute house is to taper the sides of your front and back sections so that they curve slightly towards the base. This gives the true gingerbread cottage shape to the house when it’s assembled. Fruit by the foot is rolled down for a curvy shingled look to the roof and the candy trimmed round window and eaves is very whimsical. Continue the curved look with your icing decorations and the shape of the gingerbread trees for most dramatic effect. And don’t forget to add Mr. Grinch as a cookie to the scene! Rounding out the gingerbread houses collection is this traditional candy gingerbread house. This was our family’s project last year and it was a lot of fun to do. I even added an eave over the front door and lean to on the side of the house for some extra dimension to the project. Ring pop Santa Claus, Christmas trees and penguins gave me the seasonal figures and the house had a lot of candy in the way of decorations. You can find the tutorial for this gingerbread house here. 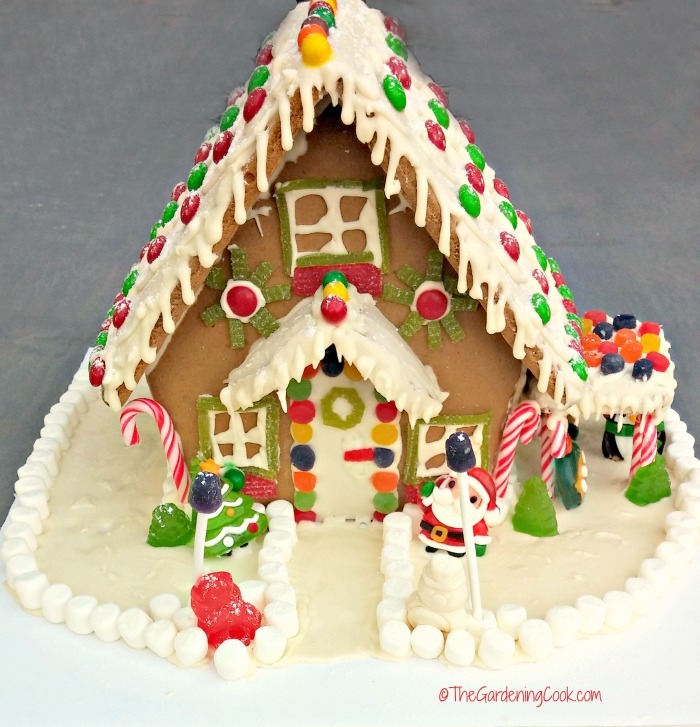 Would you like a reminder of these easy gingerbread house ideas and tips? Just pin this image to one of your Christmas boards on Pinterest. Now it’s your turn. 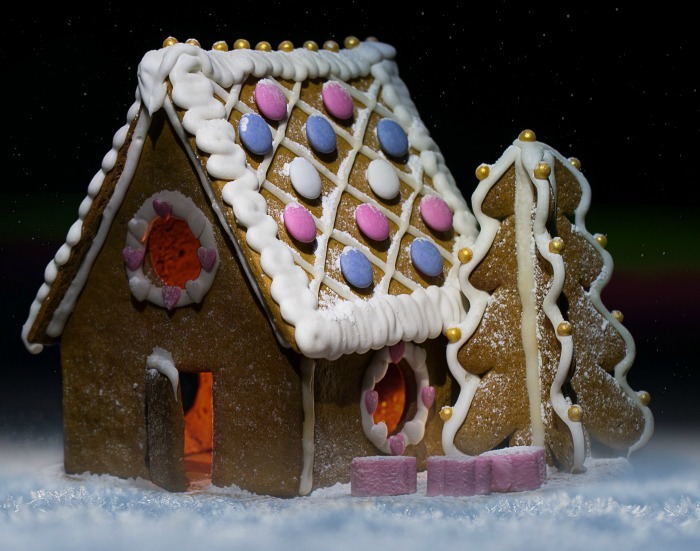 Do you have a photo of your gingerbread house creation? Upload it to the comments below so that others can admire your work.